Okay, my friends, I am SUPER hyped up on on caffeine right now because I just drank like 6 real pumpkin mocha lattes to make sure I got the recipe just right. I may not be able to cook elaborate meals, but I don’t mess around when coffee is involved, especially considering today happens to be International Coffee Day. This recipe is actually inspired by the two largest (and competing) coffee chains in the US. I go to my local Dunkin Donuts like every other day. The girl who works the night shift is fantastic. She makes everything just right. I asked for an iced mocha pumpkin coffee and it was delicious. Then, my cousin’s girlfriend, who works for Starbucks (which I also love, there’s plenty of coffee love in me to go around), told me that this year, the chain is using real pumpkin puree in their pumpkin spice lattes. 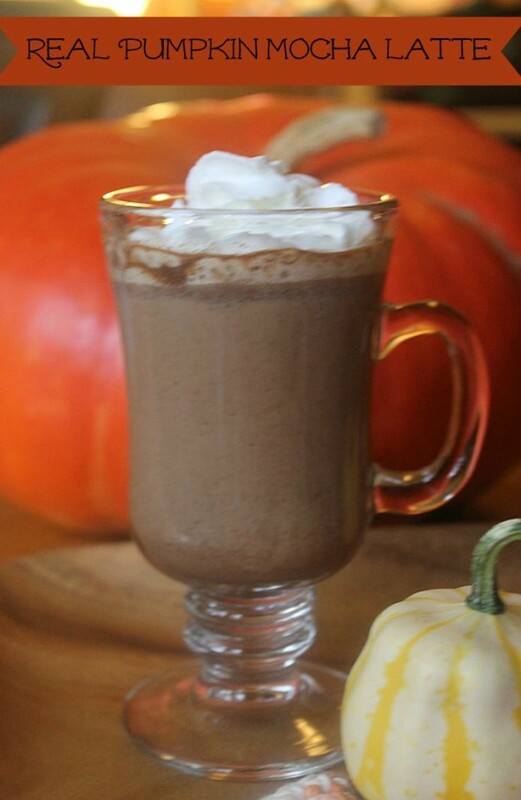 So, I had this post for the Mocha Hop, and I thought, hmmmm, mocha pumpkin was yummy, real pumpkin puree sounds good, how about a hot real pumpkin mocha latte recipe? So here you go! This makes enough for just over two 6oz fancy cups. I drank both by myself after photographing. You’re making two things at once here, so I’m going to assume you know how to brew espresso and skip the directions for that part. Also, you can brew it in so many ways. I actually used a Bialetti Moka Express that my brother brought back from Italy for me! How’s that for authentic mocha! Use an espresso maker or whatever else you want. Just start making it about halfway through your milk prep process. Now, on to that. There are two ways to do this. Method one is faster, but messier. I did both methods, but only did this one first. The last step will tell you why! Fill a Pyrex-style glass measuring cup with 6 oz milk. Continue until all your ingredients are blended and your milk is nice and hot. Merge the two happily together by first filling the glass halfway with the milk mixture, then the rest of the way with the coffee. You can completely adjust this depending on your tastes. I like a half/half ratio because I LOVE my coffee. When I make something like this for my mom, it’s 4 oz milk to 2 oz coffee. The result is a delicious real pumpkin mocha latte that isn’t overpoweringly sweet. It has just the right amount of pumpkin and mocha. Plus, pumpkin is a vegetable! That means it’s good for me, right? 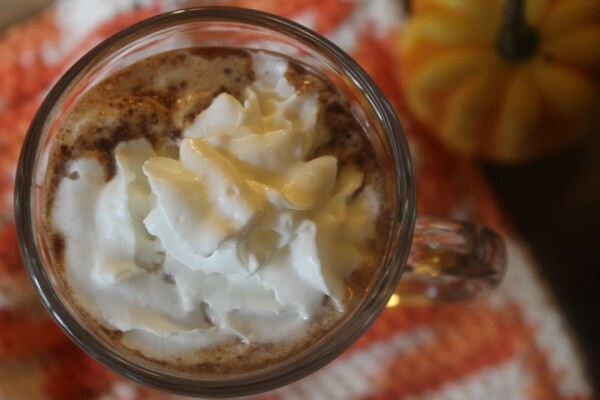 For more delicious mocha recipes visit a few of my favorite bloggers. What are YOU drinking for International Coffee Day? Tell me in the comments! That looks so good. I’m going to try it with coconut milk and stevia! I used Stevia in mine, I’ll have to try it with the coconut milk! Yum… perfect for this time of year! Looks delicious! My sister and Dad and I would love to try this homemade drink. 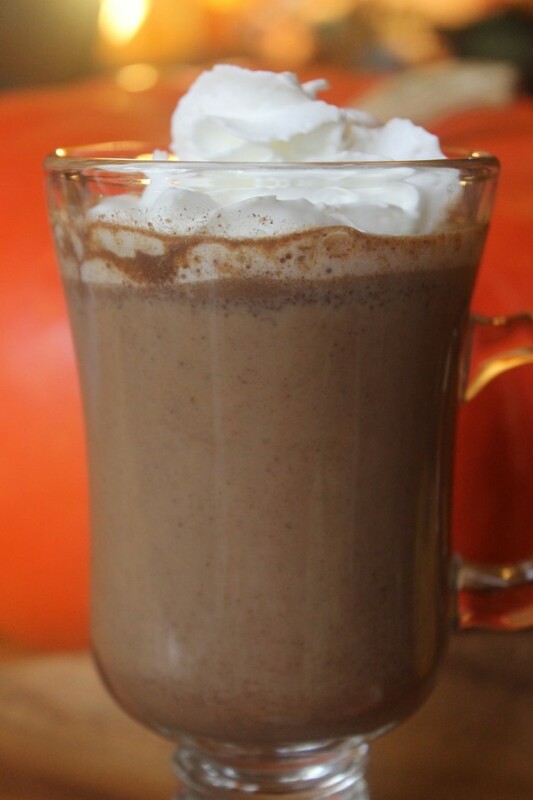 We love drinking Pumpkin Spice drinks in the Fall and I will have to make this real soon. Thanks for sharing a awesome recipe! This sounds so tasty. I love pumpkin flavored things, especially in the fall. That sounds delish! I love these kinds of fancy schmancy drinks – especially when they are pumpkin flavored. Oh I would just love to try this. I love a lot of flavor in my coffee and this would be perfect. It looks so rich, perfect for the coming nights! I would love to try this recipe! What a yummy drink. My husband loves to drink coffee after eating dinner. I’m sure he’ll love this. I bet this is a wonderful yummy drink! I’ve never even had a pumpkin spiced latte, but I’d probably rather make it at home. I’m not normally a fan of lattes, but this Pumpkin Mocha Latte looks like I might enjoy it! Perfect for the fall weather! That looks so good. I’m not much on coffee so I wonder if it would taste good made with hot chocolate instead. Oh My! Pumpkin and Mocha and Espresso! This is a life-changer. This is the perfect recipe for fall I can wait to try it! This looks so delicious! Fall is upon us so I need a few new latte recipes. Yum, this looks so delicious and just in time for the fall season of pumpkin. This looks so good! My daughter loves pumpkin latte’s. Will have to give this a try. This sounds wonderful, and I can’t believe how perfect! I made something a few days ago that left me with half a can of pumpkin stored in a mason jar in my fridge—now I know what to do with it. Oh my! This looks so decadent and delicious. What a treat this would be. This is perfect for Thanksgiving.